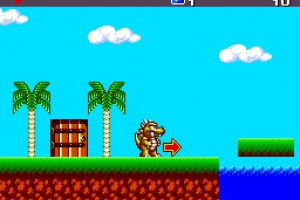 Those of you that used to own a Sega Master System may experience an unshakable feeling of deja vu when playing Dragon's Curse (known as Adventure Island in Japan) - because it's pretty much the exact same game as the Master System Wonder Boy III: The Dragon's Trap! 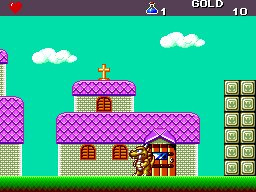 The history of the Wonder Boy franchise is complex and hard to explain, but in simple terms Sega own the..
After defeating the Mecha Dragon in the depths of the Dragon Castle, the wounded beast casts a spell on the hero, turning him into an ugly creature. To return to human form, he must find the Salamander Cross, which can break any curse. This side-scrolling action role-playing game is nonlinear, allowing players to venture freely. Collect gold and items while upgrading equipment and powering up stats. 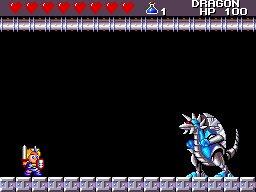 The hero starts as Lizard-Man but, upon defeating the dragon bosses, is changed into other creatures such as Mouse-Man, Piranha-Man,Tiger-Man and Hawk-Man. Each creature possesses distinct abilities such as the ability to fly, swim, walk on ceilings or cling to walls. Players use each creature's special skills to widen your search for the Salamander Cross and bring the hero back to his human form! One of the best games on the Sega Mastersytem, but the TG-16 version is even better! Wow, never even HEARD of this game. I might give it a shot based on your review. @Don-Bon - if you're a fan of old school platform/adventure games with a small rpg element you're in a for a treat! you cant beat monsterland on the master system. and this one is pretty sweet. time for some downloading!!!! I still own an original Master System copy of this game. Put simply, it's a must have. Download and enjoy! A truely excellent game! Brings back old memories. I just love the music on it. Loved it on the master system. Is it just me or is anyone having problems with the controls? sometimes when I press a directional button I fire instead? 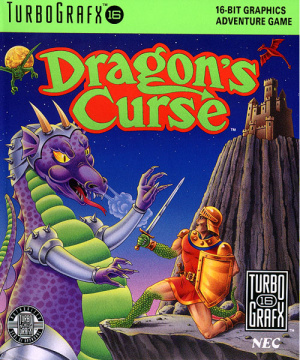 "Thankfully things a bit brighter, as Hudson unleash an excellent game in the form of Dragon's Curse (AKA: Adventure Island, Wonderboy: The Dragon's Trap)." Adventure Island is no where same as this title. I am a very big fan of Adventure Island and still waiting for that title to release on the VC. This title, however, seems interesting. Maybe i'll find some spare change and buy it onto my Wii. 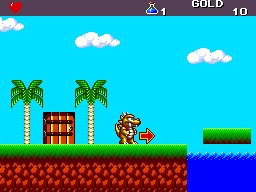 Dragon's curse may not play like the rest of the Adventure Island/Wonderboy series, but that doesn't stop it from being one. Thats like saying Super Mario 2 (AKA Super Mario USA in Japan) is not part of the Mario series because it so much of a departure from the original. Is it worth the 600? I can only download like 1 game a month because my internet has a low usage limit. Is it worth being that one game? Is there any chane of anything else big coming out this month? Things like Mario rpg, paper mario, or super metroid? It entirely depends on what sort of games you like. This is an excellent game and will keep you busy for ages. I would say go for it, your 600 points will be well spent this month! Dragon's Curse is easily worth the 600 points. 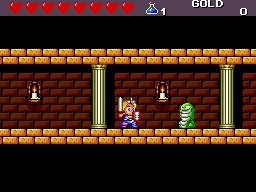 Of all the Wonderboy games, I hold it second only to Monster Land. If you're under bandwidth restrictions, I would suggest considering it as a "last minute" download for this month (Like some, I'm hoping to see to see Zelda 2, Super Mario RPG or Super Metroid released on the US VC this month as well), but it really is a must-have title if you're a fan of side-scrolling action RPGs / adventure games. I like action games. Is it kind of like kirby's adventure? That's my favorite vc game. This is a great game, but how is it better that Zelda 2? I mean they are very similar, but the X factor is, is that it's Zelda!! Zelda 2, and this game should have gotten the same review! WE WANT ZELDA 2 IN THE STATES!!!! This game wipes the floor with Zelda 2 though, and the soundtrack isn't just jolly, it's superb! How much am I enjoying replaying this? It must be 17 years since I last played this and I still remember most of the secrets. Stuck on the level with the ninjas and samurai though! Can get to the dragon but he's TOUGH! 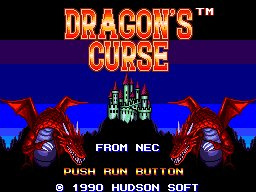 Dragon's Curse is a cutesy time-waster, but it is certainly not in the same class as Zelda 2 or Faxanadu. Get this only if you have extra Wii points to spare. 3/5. I have to say, this game was a surprise. I had never heard of it, but purchased it based on what was said here. It was well worth it, the game was a lot of fun and challenging too. 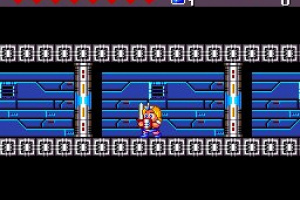 Love this game, normally old games are easy as, but this presented a bit of challenge and hurrah for the screens scrolling both ways, not jjst simple left to right. In more recent years, we've seen entries like Symphony of the Night flood this genre but to really see where it started, it's good to look at the Master System and the Super Nintendo. I feel that this was really one of the cornerstones though, a turning point that showed how much depth a game of this kind could have, especially for an 8-bit system. In ways, for the era I suppose I'd almost consider this one a technological marvel, due to the free-roaming nature of it, the multiple characters and everything else. There are definitely better examples out there today of this kind of game (look up Cave Story/Doukutsu Monogatari), but game definitely has historical relevance and anyone interested in the genre I've described should give it a look, to see one of the points where this genre really began to take shape. Upon playing this recently, I think this version is a mixed bag. Sure, the graphics are updated slightly and it plays a bit smoother than on SMS so it's easier to control.. But the story, while there isn't a lot to it to be honest, was completely ruined! It sounds like early 90s american marketing with slang like "totally radical" and "vicious dudes" put in it. It really ruins the atmosphere of that cool intro level. The music and sound fx is better in some places but worse in others. It often sounds cheesy and dated with different harmonies and rhythms in some songs, though the overall sound quality is improved. The new "enemy death" sound is pretty annoying though. Also, there seems to be a bug in this version that makes you have to pick up heart pieces in the correct order or they won't appear! It didn't happen to me but I've read about it a few times. "Dragon's Curse is a cutesy time-waster, but it is certainly not in the same class as Zelda 2 or Faxanadu. Get this only if you have extra Wii points to spare. 3/5." It's more manga than cutesy though. Zelda 2 and Faxanadu are so flawed that I would almost call them broken. Faxanadu has really crappy controls, strange level design that can get confusing and frustrating, and the environment gets very repetitive. Zelda 2 has pretty much the same flaws, except the control is slightly better but on the other hand it's more confusing. The dialogue is crap, all towns look the same, most difficult enemies are easily defeated by jumping and slashing their heads, the difficulty curve is actually Reversed.. Finally both these games soundtracks are much worse than WB3/Dragon's Curse. "Also, there seems to be a bug in this version that makes you have to pick up heart pieces in the correct order or they won't appear! It didn't happen to me but I've read about it a few times." It happened to me but if you go back and get the heart you missed you can still get all of the hearts. It is nothing like Adventure Island, thats why! 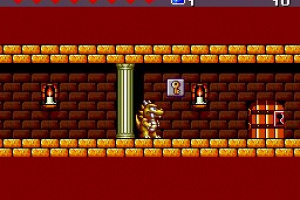 It's based on Wonderboy 3 the dragons trap from the Sega Master System. 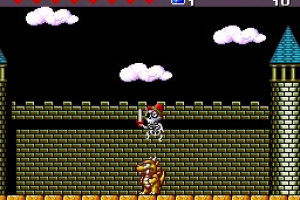 The Adventure Island series evolved from Wonderboy 1 which was a vastly different style of game. I remember playing this game as a kid! Man, the VC is bringing back all kinds of memories for me lately. Very fun little game, and the shapeshifting topped things off for me back in the day. Speaking of Faxanadu, I wouldn't mind seeing that on the VC at some point, too! Holy crap! This was on Game Gear too?!!! How the hell did I miss it? 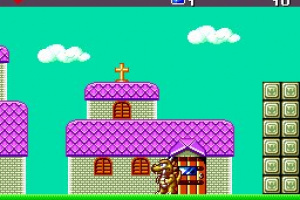 Wonderboy 3: The Dragons Trap was easily one of the greatest 8 bit console titles every created. As already mentioned this is pretty much identical except for some of the sprites. 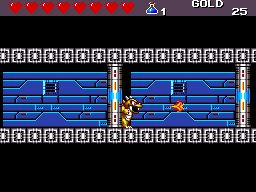 Comparisons to "metroidvania" games are inevitable, but keep in mind when this came out only Metroid was released and this far outshines it, and Castlevania hadn't started ripping off the Metroid series just yet... so this isn't really as unoriginal as it may sound. It basically expands on the concepts of the first Monsterworld title (Wonderboy in Monsterland/Bikkuriman World) by adding a bit more exploration into the mix. 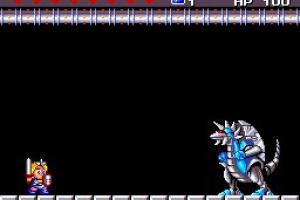 Your character changes forms periodically throughout the game giving you different abilities, attacks and stats, and also access to different areas of the game previously unreachable. There is a little backtracking at times and it's still slightly linear unlike some of the later metroid/vania titles, but it's still a great little action adventure romp. 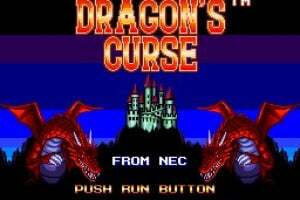 Dragons Curse does have the edge over the Master System version for a few simple reasons. Firstly the graphics. This version has silky smooth scrolling whereas the Master System version had a lower frame rate for some reason. Secondly you can save your game in this and not have to worry about writing down passwords. Nope! The Master System version was better for the simple reason that Pirana-man looks more like Bart Simpson when swimming. GumbyX. This game does fit in well with the rest of the series. 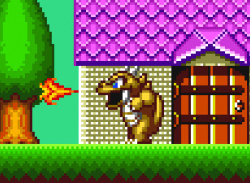 It has the last castle from Monsterland, and the familiar zones, and Monster World 3/Wonderboy 5 plays a lot like it. 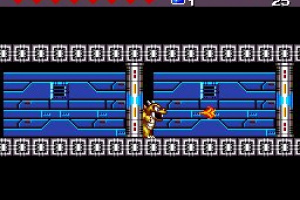 It may not have the transformations like Dragon's Trap, but you do have to find certain weapons to be able to access different places. Great game. I had never even heard of the series before i DL this one, and I enjoyed it a lot. 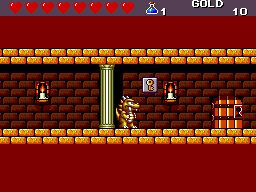 I prefer Wonder Boy in Monster World, but this still has it's moments. This is why I love VC. Gems like these, buried in time, only to be excavated and enjoyed by a lonely gamer with an itching trigger/face button finger all these years later. I really don't know why I like this game. 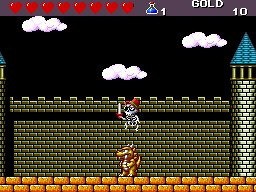 The music is great, but the enemies are basically the same throughout, swords and shields don't make much of a difference to the eye, and the game will most likely send you to your death more than you'd like. Yet I still like it. Maybe it's the ability to change into different characters or the excellent level design (as the major reviewer claims it to be), but something makes me like this game. I can't recommend it to everyone, but I guess if you like the Wonderboy series, this is as good a game as the others. This is a great deal of fun but after a while I just started getting lost. I can't play the original Metroid either -- I just gotta have a map screen! I just can't get behind this one. Inspiration for other games or not, the gameplay is tedious after a while. What fun that is there to be had, is often times immediately countered by tedious back tracking and always annoying/glad it's over respawning enemies. I love this game. Cute, fun to play, sort of non-linear, nice music, and just generally makes me feel good while playing it. I never heard of the series before, and I really hope they release the other titles. I bought this about a month ago, and after about an hour of playtime a week, I finally beat it. Excellent game. 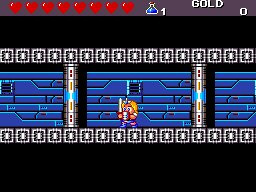 By the way you have to get the heart in order on the mastersystem version as well its not a bug. I tested it in KEGA emulator the other day. The 3rd heart is easy to miss and from there on you could be in trouble so you should goto the other side of the pyramid to get it. I love this game, have done for years. Played in on the Master System when it was new, and still play it now. Just glad that due to the VC I dont have to dig old consoles out every time. Also having the pause button on the pad and not the console is a godsend. Can you save or do you use passwords as in the original version? Skrubber there is a little save booth in the game. So, is this a REMAKE of Wonder Boy III? 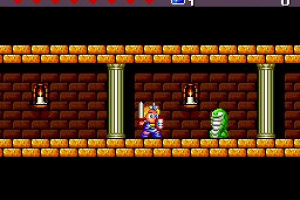 Yes this is basically the same as Wonderboy III except the main character is different. Other than the enhanced graphics (over the SMS version) it's identical. This is a great and challenging game. A bit underrated if you ask me. Just DL It, it was hard to decide between this one and Neutopia, I just fell for the platform part I think. As others said it's challenging, and I love that you can freely explore the levels, so far I like it. Brilliant game, even better than the Master System version. This is the game that made me discover the TG-16 and how great it was. I wish it was longer, and that grinding for money wasn't such a boring and repetitive task, but hey...you can't have everything.